It's easy to join — just fill out the form below! We are proud to introduce the Around The Clock E-Club! 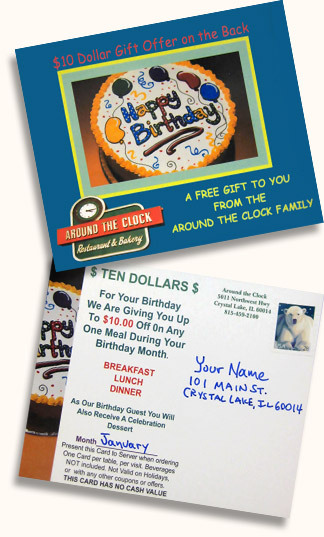 For several years now many of our customers have taken advantage of the Around The Clock Birthday Club. During their birthday month, our members are invited to visit Around The Clock Restaurant and receive up to $10 off their meal. E-Club members will automatically be enrolled in our Birthday club and receive the same discount. Members will also receive occasional special offers, promotions, and discounts via email. The club is FREE — there is no fee for joining, no obligation, and you can cancel your membership at any time. How would you like to receive email? Around The Clock Gift Certificates — perfect for friends, family, co-workers. Join our E-Club — receive a special gift from Around The Clock on your birthday!